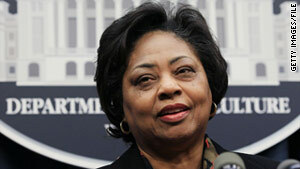 Former USDA official Shirley Sherrod has filed suit against blogger Andrew Breitbart. NEW: Andrew Breitbart is "confident of being fully vindicated"
(CNN) -- A former Department of Agriculture employee who was forced to resign last year after the posting of a misleading video has filed suit against Andrew Breitbart, the conservative blogger who posted it. Shirley Sherrod's suit was filed in District of Columbia Superior Court on Friday. The civil suit accuses Breitbart of "defamation, false light and infliction of emotional distress," according to a statement issued by the law firm representing her. "This lawsuit is not about politics or race," Sherrod said in the statement. "It is not about right versus left, the NAACP or the Tea Party. It is about how quickly, in today's internet media environment, a person's good name can become 'collateral damage' in an overheated political debate. "I strongly believe in a free press and a full discussion of public issues, but not in deliberate distortions of the truth," Sherrod said. "Mr. Breitbart has never apologized for what he did to me and continues -- to this day -- to make the same slurs about my character." Breitbart, meanwhile, said in a statement, "I find it extremely telling that this lawsuit was brought almost seven months after the alleged incidents that caused a national media frenzy occurred." He said he believes it is "no coincidence" that the suit was filed the day after he held a news conference calling for a congressional investigation into the settlement of a case -- Pigford v. Glickman -- reached more than a decade ago between the USDA and minority farmers. The U.S. Senate in November approved a $1.15 billion measure to fund the settlement of the 1997 case, settled out of court 11 years ago. Under a federal judge's terms dating to 1999, qualified farmers could receive $50,000 each to settle claims of racial bias. "I had seven months to investigate why Shirley Sherrod was fired, and it has nothing to do with the single clip that is mentioned exclusively in the media narrative," Breitbart told CNN on Monday. "Shirley Sherrod is a central figure to the largest single politically motivated fraud in the history of the United States. It's called the Pigford black farmers' settlement." Breitbart said Sherrod's husband and the couple's "defunct communal farm ... collectively were the largest recipients of compensation in that lawsuit." Sherrod attorney Tom Clare declined comment on Breitbart's statements. Sherrod, who is African-American, was forced to step down in July as the department's director of rural development for Georgia in July after video of a speech she made was posted on the internet and reported on by the media. In the video, Sherrod seemed to suggest that she did not do all she could to help a white farmer. The suit names Breitbart, producer Larry O'Connor and an unknown "John Doe," Sherrod's attorneys said. The identity of John Doe has been concealed by the other defendants, the lawsuit says, but that person "was involved in the deceptive editing of the video clip and encouraged its publication with the intent to defame Mrs. Sherrod." "Mrs. Sherrod was forced to resign from her job after defendants ignited a media firestorm by publishing false and defamatory statements that Mrs. Sherrod 'discriminates' against people due to their race in performing her official duties," said the lawsuit. "Defendants drew false support for their claims from a speech given by Mrs. Sherrod that they edited, deceptively, to create the appearance that Mrs. Sherrod was admitting present-day racism. In fact, Mrs. Sherrod was describing events that happened 23 years before she held her federal position and, in fact, was encouraging people not to discriminate on the basis of race." In the short, edited video clip, Sherrod told her audience that the farmer she was working with "took a long time ... trying to show me he was superior to me." As a result, she said, she "didn't give him the full force of what I could do. I did enough." She said that to prove she had done her job, she took the farmer to a white lawyer. "I figured that if I take him to one of them, that his own kind would take care of him," she said. The speech was given in March 2010 to the Georgia NAACP's annual Freedom Fund Banquet, according to the lawsuit. The edited video clip was posted on Breitbart's BigGovernment.com website. After the clip was posted, Sherrod said the incident she spoke of occurred in 1986, while she worked for a nonprofit and before she worked for USDA. And, she said, "I was telling the story of how working with him helped me to see the issue is not about race. It's about those who have versus those who do not have." And the white farmer she discussed, Roger Spooner, later came forward, crediting Sherrod with helping save his farm. "Mrs. Sherrod's assistance to (the Spooners) has resulted in a lifelong friendship between the families," the lawsuit says. Agriculture Secretary Tom Vilsack later apologized to Sherrod, and President Barack Obama called her. Sherrod declined Vilsack's offer of her old position back, or a newly created position as the USDA's deputy director of the Office of Advocacy and Outreach. Vilsack has said he acted on his own in asking for Sherrod's resignation. But in an August interview with CNN's "AC360°," Sherrod maintained the White House was behind it, even though she said it might be "others working for the president." She said she was told the White House wanted her to resign. Just after the incident in July, Breitbart told CNN that he had not specifically targeted Sherrod or asked that she be fired. He also posted corrections on the blog entries, clarifying that the incident Sherrod referenced did not take place during her tenure at the USDA. In a statement posted Saturday on BigGovernment.com, Breitbart said that at the Thursday press conference, he revealed two hours of audio which he says are of Thomas Burrell, the head of the Black Farmers and Agriculturalist Association. Inc., "teaching non-farmers how to commit fraud in the Pigford 'back-door' reparations case. This audio conclusively demonstrates how people have conspired to grow the class of Pigford claimants to 94,000, when there were only about 18,000 black farmers in the entire country during the relevant time period. ... The numbers just do not and cannot add up." Reached at his Tennessee office, Burrell told CNN the allegation is "par for the course." "There are just some folks who can't stand the fact that this aggrieved group of individuals may finally receive some redress," he said. He said his advocacy group holds workshops across the country to help educate those who might be eligible for redress under the lawsuit, but denied encouraging anyone to commit fraud. "I'm a law-abiding citizen," he said. "The lawsuit is not a farming lawsuit," he said. "It's a discrimination lawsuit, so a person doesn't have to farm to be a plaintiff in this lawsuit. All they have to show is that they were a victim of discrimination" by the USDA in some form, he said. The BigGovernment.com statement said Breitbart "categorically rejects the transparent effort to chill his constitutionally protected free speech and ... looks forward to exercising his full and broad discovery rites. Mr. Breitbart is absolutely confident of being fully vindicated." CNN's Elizabeth Mayo, Carol Cratty and Dave Alsup contributed to this report.